We believe dogs are very trainable and that there is a good chance that if your dog is doing something you don't like, you have been unintentionally rewarding your dog with attention which causes him to continue doing the behavior. 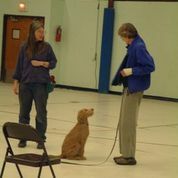 Positive Methods are very effective in helping your dog become a confident and well-behaved companion. We use lure-reward methods coupled with the use of an event-marker (a click or a verbal marker "yes!") to achieve superior results.